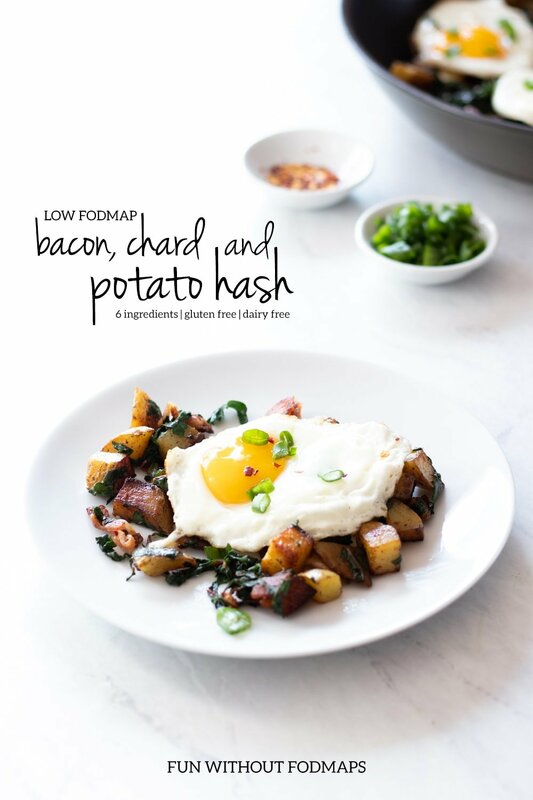 Ready in less than 30 minutes, this 6-ingredient Low FODMAP Bacon, Chard and Potato Hash recipe is an easy veggie-packed meal idea for breakfast or supper. It is also gluten-free, dairy-free, and has no added sugar. For whatever reason, my body and most dairy products, even the low FODMAP lactose-free kind, do not get along. 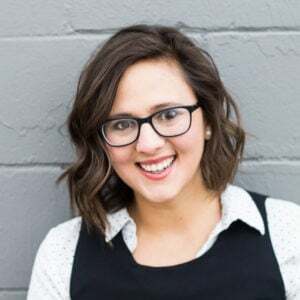 For most Americans, dairy products are key sources of important nutrients, like calcium and vitamin D. But, for people who don’t consume dairy products, which may be for a variety of reasons, it can be challenging to get enough of these nutrients. One naturally-occurring plant-based source of calcium is dark leafy green vegetables, like collard greens, spinach, kale, and Swiss chard. Luckily, each of these veggies can be FODMAP-friendly and can help boost calcium intake if following a dairy-free diet. 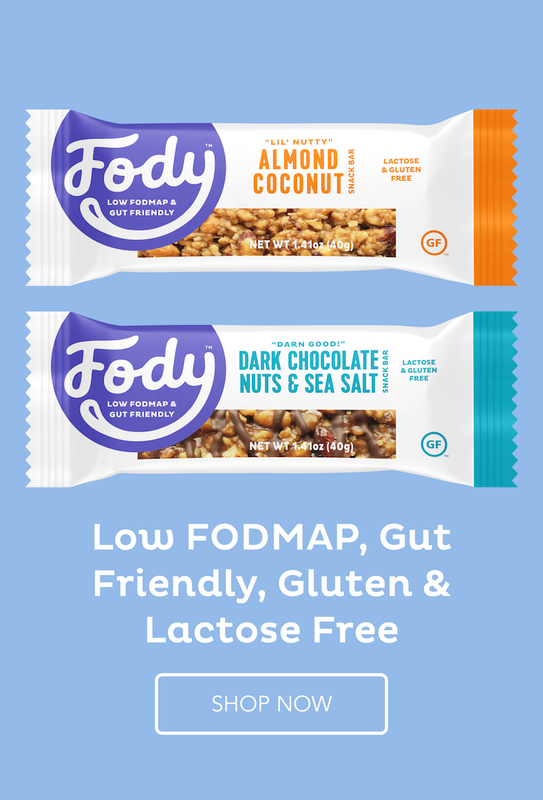 Note: The low FODMAP diet does not need to be dairy-free unless you want or need it to be for other reasons. There are a variety of low lactose or lactose-free options that can be enjoyed. Check out the Monash FODMAP app for the most up-to-date options and serving sizes. However nutritious they are, I recognize dark leafy green vegetables may not be most people’s first (or twentieth) choice when it comes to veggies. It’s important to remember that our taste buds can change. In fact, I’ve slowly added more into my diet over the years and now eat (and enjoy) them on most days. 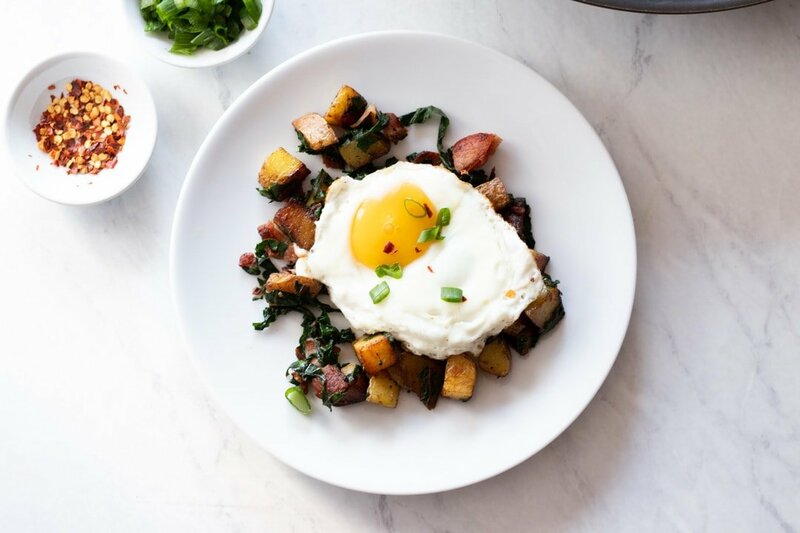 If you’re looking to start, try adding them to soups, stir-frys, curries or savory breakfast-type dishes like this Low FODMAP Bacon, Chard, and Potato Hash! What is Swiss chard? Swiss chard, also known as silverbeet in some parts of the world, is a type of green leafy vegetable. It has big, dark green leaves and thick, celery-like stalks that can come in a rainbow of colors including red, orange, yellow, and white. 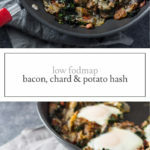 Is Swiss chard low FODMAP? Yes, Swiss chard is low FODMAP. According to Monash University, only trace amounts of FODMAPs were detected when it was tested. Why eat Swiss chard? Like other dark green leafy vegetables, Swiss chard is packed with nutrients. In fact, it is an excellent source of vitamins A and C, as well as a good source of magnesium (source). 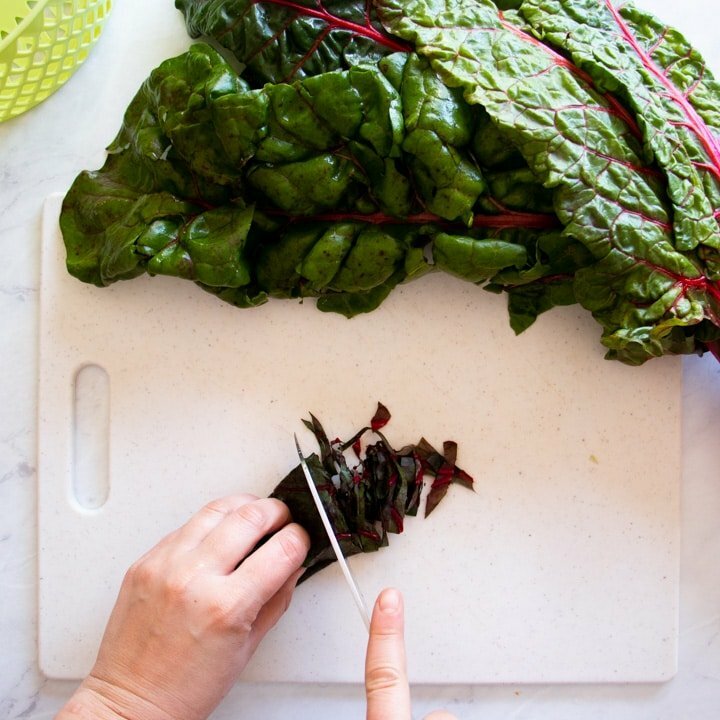 What does Swiss chard taste like? Swiss chard leaves taste similar to spinach. Some people may find there to be a hint of bitterness, but the flavor is definitely not as pronounced as kale or some other cooking greens. The stalks are also edible but tend to be tough and fibrous. 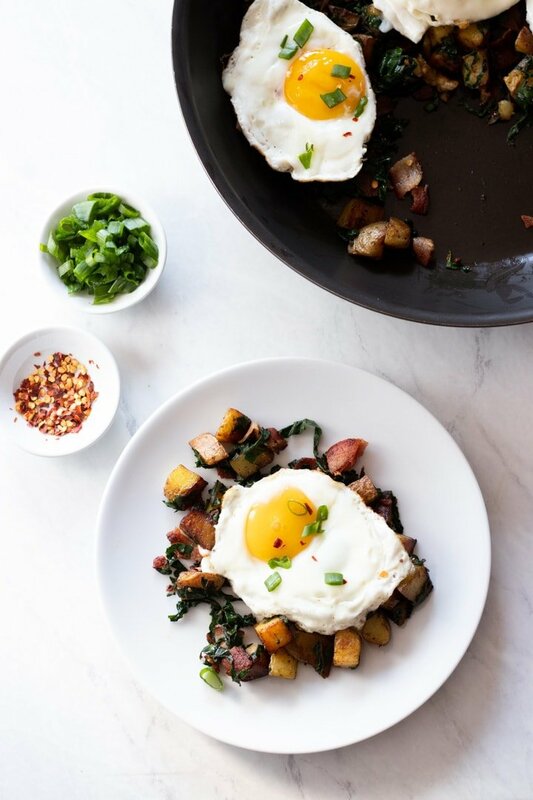 Yukon Gold Potatoes work fabulously in breakfast hash recipes due to their firm yet moist texture. I like to “par-bake” them in the microwave to save time and help them cook more evenly when they’re added to the frying pan. 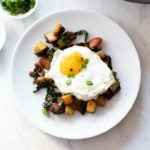 Lower Sodium Bacon is a classic American breakfast staple and pairs nicely with the Swiss chard. Garlic-Infused Oil adds a touch of FODMAP-friendly garlic flavor. You can find two of my favorite garlic-infused oil options here and here. Swiss Chard wilts down to practically nothing when sauteed making it easier to meet our five (or more) recommended servings of veggies and fruits. Red Pepper Flakes (optional) add a kick to this recipe. Although low in FODMAPs, they do contain capsaicin which can be a non-FODMAP trigger for some folks. Large Eggs boost the amount of satisfying protein in this dish. If you’re feeling extra hungry, add another egg to your serving. 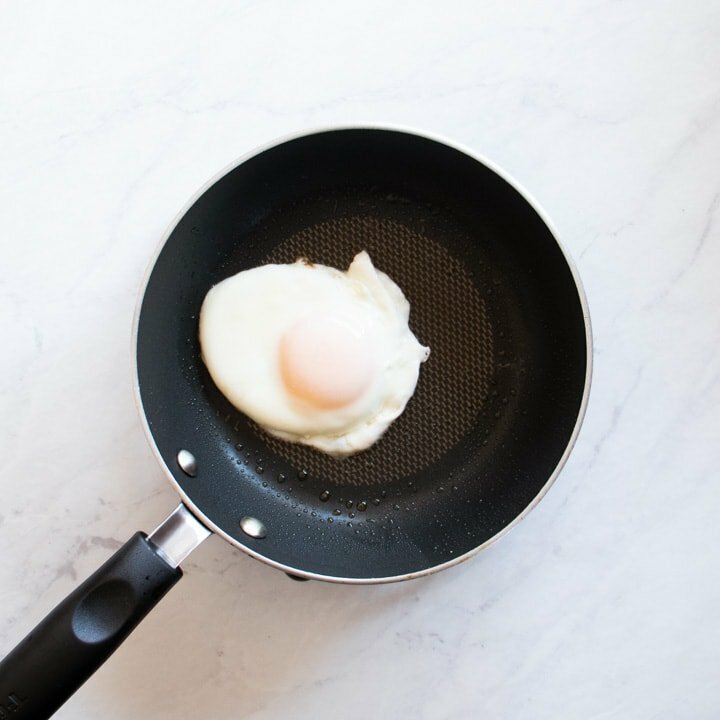 Eggs are naturally FODMAP-free. Green Onion Tops (optional) add FODMAP-friendly onion flavor. Although the white bulbs are high in FODMAPs, the green tops of green onions are low in FODMAPs and can be enjoyed throughout the entire low FODMAP experiment. “Par-bake” the potatoes. Place the potato pieces on a microwave-safe plate and cover with a damp paper towel. This will help prevent the potatoes from drying out while microwaving. Microwave for 2 minutes. Stir the potatoes. Re-cover and microwave for another 2 minutes or until the largest potatoes pieces are just starting to soften. Set aside. Brown the potatoes. To the warm bacon grease in the pan, add a ½ tsp. garlic-infused olive oil and the potatoes. Continue to cook over medium-high heat, stirring every minute or so, until the potatoes start to turn golden brown and the largest pieces are cooked throughout (about 4 minutes for me). Wilt the chard and add flavor. 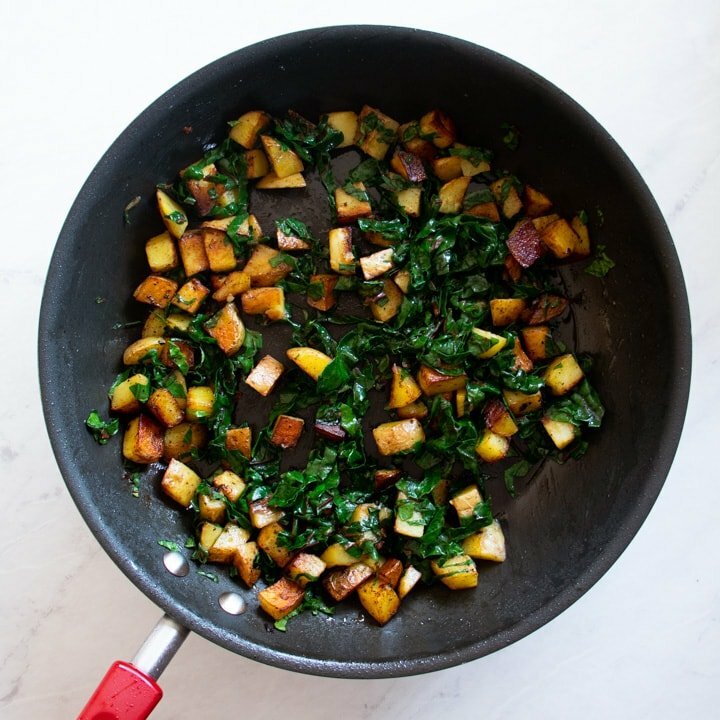 To the cooked potatoes, add the remaining ½ tsp garlic-infused olive oil and shredded Swiss chard. I promise the greens will shrink down. 🙂 Stir and cook until the leaves have shrunk down to less than half their original size. Stir in optional red pepper flakes and cooked diced bacon. 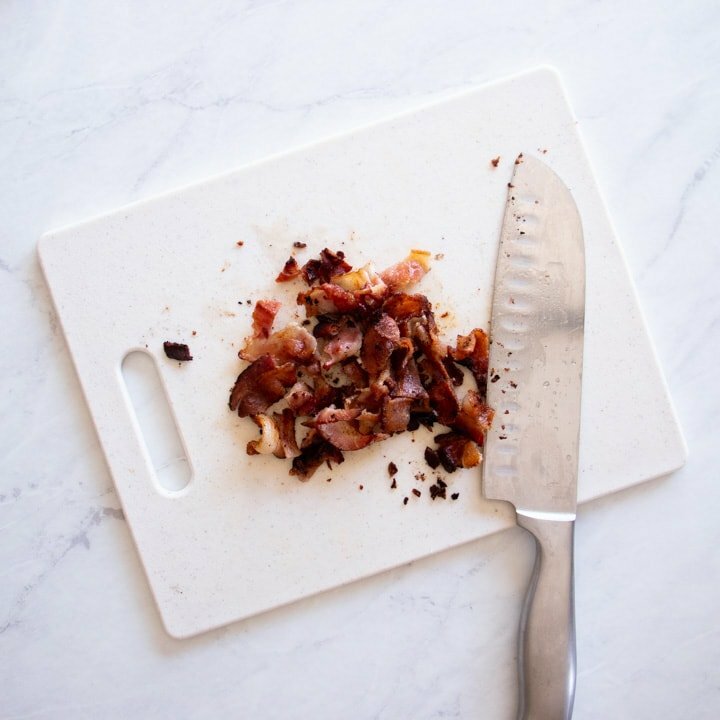 Remove the hash from heat, cover to keep warm, and set aside. Fry the eggs. In a separate skillet, cook the eggs to your preference. I prefer to do this one egg at a time in a small frying pan coated with nonstick cooking spray. It’s a bit more involved, but then everyone gets the type of egg they want. I will heat the pan over medium to medium-high heat. Add the egg. Cover the pan. Cook 1-2 minutes or until the bottom egg white is set. Flip. Cover and continue to cook until the yolk is done to your preference. Season with salt and pepper. Serve warm. 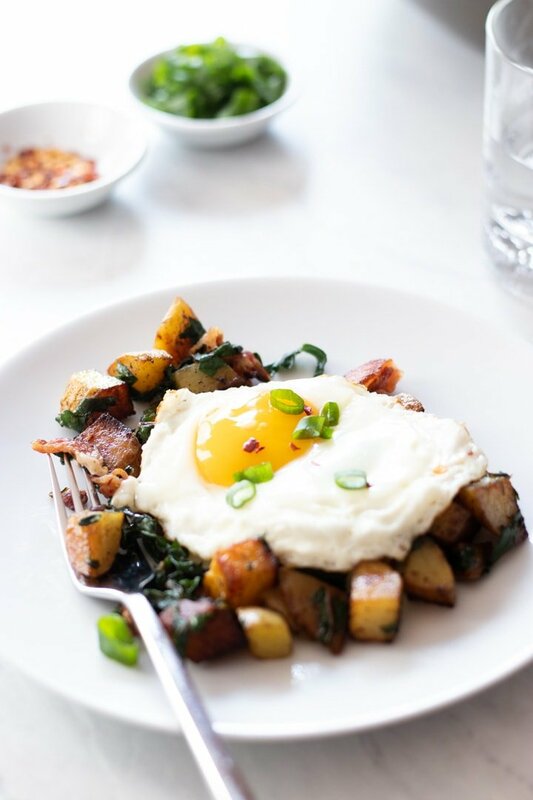 Divide the hash and serve each portion topped with a cooked egg. Garnish with optional green onion tops (green parts only) and serve. 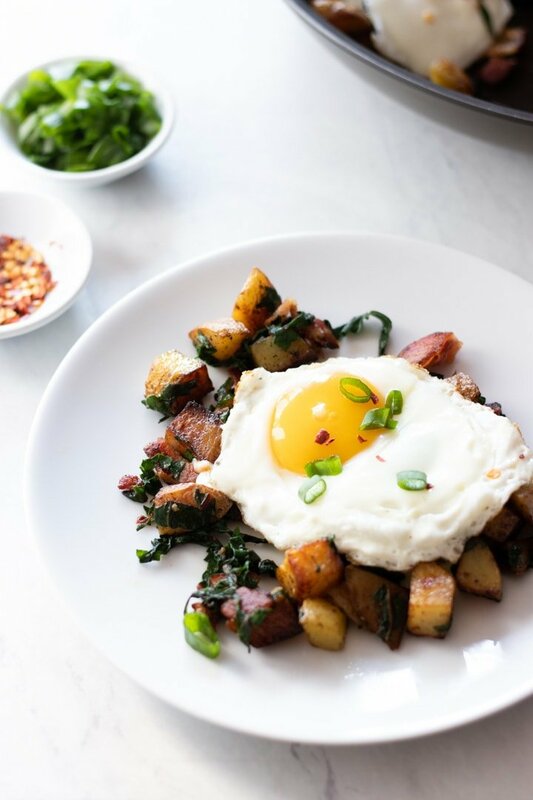 Double up on eggs to add more protein with zero added FODMAPs. 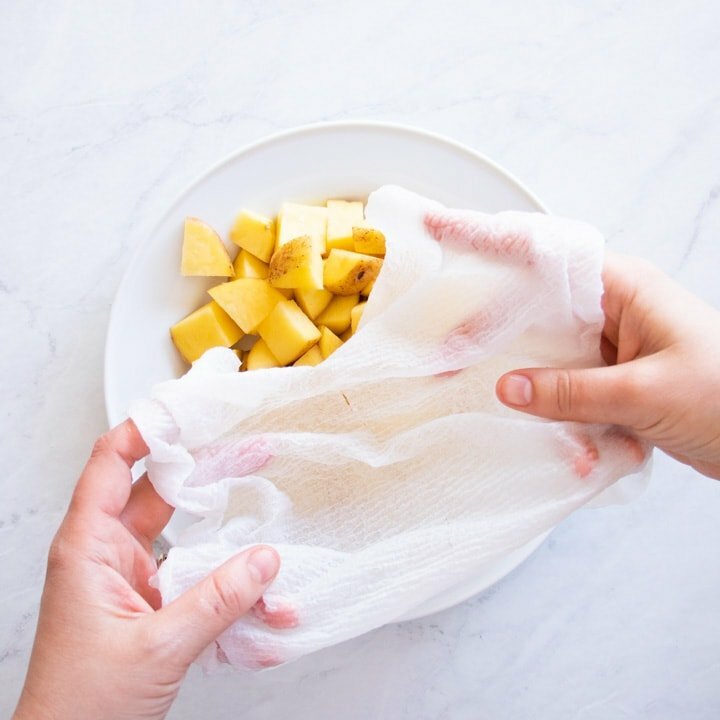 Add a FODMAP-friendly fruit like strawberries, kiwi, clementines, grapes, etc. Check the Monash FODMAP app for more options and serving sizes. Enjoy a glass of low FODMAP milk for an extra calcium boost. If choosing a plant-based option, look for one that’s fortified with calcium. Place the potato pieces on a microwave-safe plate and cover with a damp paper towel. This will help prevent the potatoes from drying out while microwaving. Microwave for 2 minutes. Stir the potatoes. Re-cover and microwave for another 2 minutes or until the largest potatoes pieces are just starting to soften. Set aside. To the warm bacon grease in the pan, add a 1 tsp. garlic-infused olive oil and the potatoes. Continue to cook over medium-high heat, stirring every minute or so, until the potatoes start to turn golden brown and the largest pieces are cooked throughout (about 4 minutes for me). To the cooked potatoes, add the remaining 1 tsp garlic-infused olive oil and shredded Swiss chard. I promise the greens will shrink down. 🙂 Stir and cook until the leaves have shrunk down to less than half their original size. Stir in optional red pepper flakes and cooked diced bacon. Remove the hash from heat, cover to keep warm, and set aside. In a separate skillet, cook the eggs to your preference. I prefer to do this one egg at a time in a small frying pan coated with nonstick cooking spray. It’s a bit more involved, but then everyone gets the type of egg they want. I will heat the pan over medium to medium-high heat. Add the egg. Cover the pan. Cook 1-2 minutes or until the bottom egg white is set. Flip. Cover and continue to cook until the yolk is done to your preference. Season with salt and pepper. 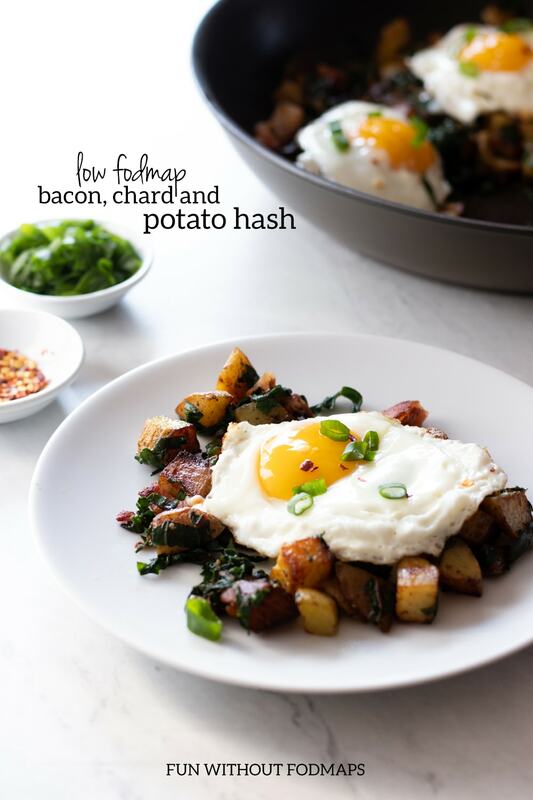 Divide the hash and serve each portion topped with a cooked egg. Garnish with optional green onion tops (green parts only) and serve. Note: This post was originally published on April 12, 2017, and last updated on March 20, 2019.